Conventionally, huge investment in the network systems and operating expenses are needed because the network is configured as a silo for each department and system. Therefore various network appliances must be installed for each tenant and those boxes cannot be shared with others. It is a heavy work to design, implement and operate the entire complex network. VTN allows the users to define the network with a look and feel of conventional L2/L3 network. Once the network is designed on VTN, it will automatically be mapped into underlying physical network, and then configured on the individual switch leverage SDN control protocol. The definition of logical plane makes it possible not only to hide the complexity of the underlying network but also to better manage network resources. It achieves reducing reconfiguration time of network services and minimizing network configuration errors. OpenDaylight Virtual Tenant Network (VTN) is an application that provides multi-tenant virtual network on an SDN controller. It provides API for creating a common virtual network irrespective of the physical network. VTN Coordinator RESTful API (1) Uses the RESTful interface of VTN Manager and configures VTN Virtualization model components in OpenDaylight. (2) Handles multiple OpenDaylight orchestration. (3) Provides API to read the physical network details. See samples for usage. The VTN Coordinator is an external application that provides a REST interface for an user to use OpenDaylight VTN Virtualization. It interacts with the VTN Manager plugin to implement the user configuration. It is also capable of multiple OpenDaylight orchestration. It realizes VTN provisioning in OpenDaylight instances. 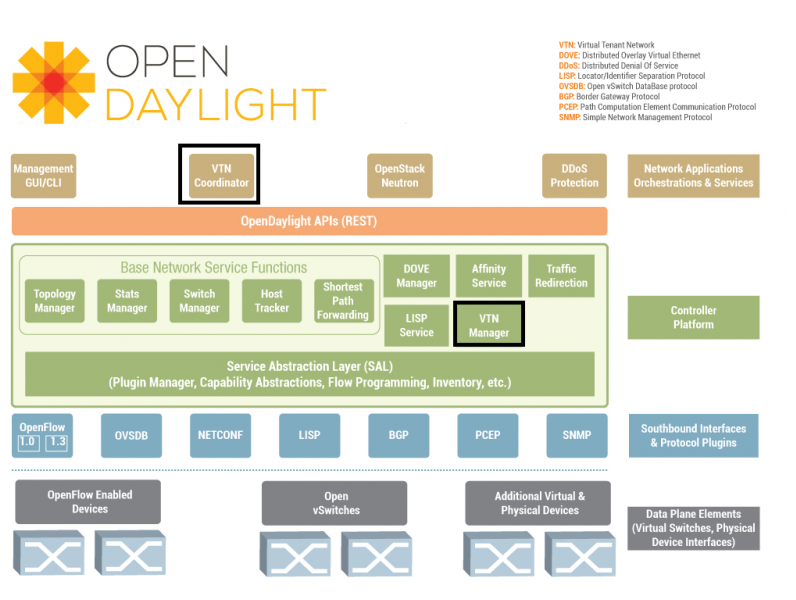 In the OpenDaylight architecture VTN Coordinator is part of the network application, orchestration and services layer. VTN Coordinator will use the REST interface exposed by the VTN Manger to realize the virtual network using OpenDaylight. It uses OpenDaylight APIs (REST) to construct the virtual network in OpenDaylight instances. It provides REST APIs for northbound VTN applications and supports virtual networks spanning across multiple OpenDaylight by coordinating across OpenDaylight. 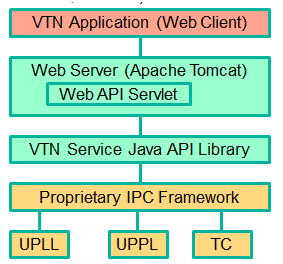 The Web Server module handles the REST APIs received from the VTN applications. It translates the REST APIs to the appropriate Java APIs. Starts via the startup script catalina.sh. VTN Application sends HTTP request to Web server in XML or JSON format. Creates a session and acquire a read/write lock. Invokes the VTN Service Java API Library corresponding to the specified URI. Returns the response to the VTN Application. It is a singleton class for executing the acquisition of configuration information from properties file, log initialization, initialization of VTN Service Java API Library. Executed by init() of VtnServiceWebAPIServlet. Maintains the configuration information acquired from properties file. Receives HTTP request from VTN Application and calls the method of corresponding VtnServiceWebAPIHandler. herits class HttpServlet, and overrides doGet(), doPut(), doDelete(), doPost(). Creates JsonObject(com.google.gson) from HTTP request, and calls method of corresponding VtnServiceWebAPIController. Creates RestResource() class and calls UPLL API/UPPL API through Java API. the time of calling UPLL API/UPPL API, performs the creation/deletion of session, acquisition/release of configuration mode, acquisition/release of read lock by TC API through Java API. Converts HTTP request to JsonObject and JsonXML to JSON. Creates an IPC client session to the lower layer. Converts the request to IPC framework format. Invokes the lower layer API (i.e. UPPL API, UPLL API, TC API). VTN Coordinator doesn’t have Karaf features.